Leading Manufacturer of automatic bike washing system, bike washing system and twin bike washing system from Pune. Being a market leader in this domain, we manufacture and supply the premium quality of Automatic Bike Washing System. Known for its consistent performance and easy operation, the offered two-wheeler washer system is used in the washing of two-wheeler bikes. In order ensure a flawless range, the offered two-wheeler washer system is rigorously checked on various parameters. Features: User-friendly operation High-performance Longer serving life Use for Single bike wash a. Error-free & Maintenance free system b. We are offering Bike Washing System to our clients. 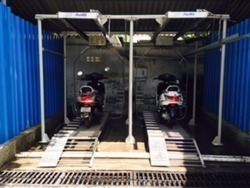 We are offering Twin Bike Washing System to our clients. Looking for Bike Washing System ?